Do The Time-Warp Again & Again With The Ultimate Collector's Anniversary Giftset Featuring Both Outrageous Campy Classics Together For The First Time! CENTURY CITY, Calif. -- The bizarre follow-up to The Rocky Horror Picture Show, Shock Treatment is just as wild and irreverent as the original, serving up insanity in microwavable, TV dinner-sized doses and offering a couch trip into the extreme (and extremely weird) world of pop culture mayhem. Never before available on DVD and celebrating its silver anniversary this year, Shock Treatment 25th Anniversary Edition arrives September 5th from Fox Home Entertainment. While its predecessor lampooned and parodied with the eccentricities of the 1950s horror genre via the outrageous pageantry of the 1970s rock-n-roll movement, Shock Treatment takes a step further, satirizing the very culture of suburban voyeurism bred by the obsessive fanaticism of The Rocky Horror Picture Show itself. Lewd, crude and bitingly shrewd, the musical spoof picks up on the rocky marriage of Brad and Janet Majors (Cliff De Young and Jessica Harper), who live in a media-saturated town ruled by reality TV, where every resident is either a contestant... or a captive! 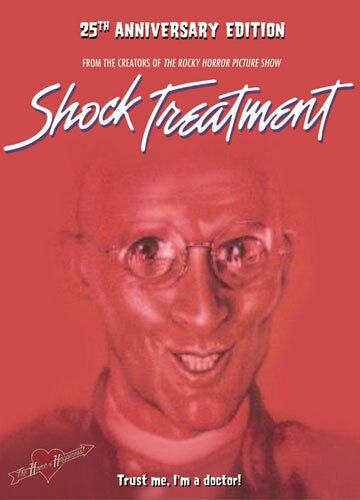 As timely as it was 25 years ago, Shock Treatment arrives fully decked out with a lavish array of extras including audio commentary by fan club presidents "Mad Man" Mike Ellenbogen and Bill Brennan, retrospective featurettes and more! Even more outrageous than its predecessor, Shock Treatment 25th Anniversary Edition is available for the suggested retail price of $19.98 U.S. / $25.98 Canada. 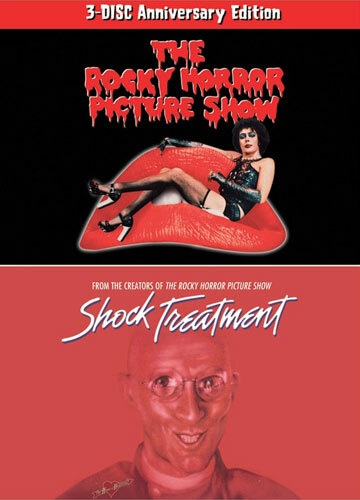 In addition, Fox Home Entertainment will also release The Rocky Horror Picture Show / Shock Treatment Anniversary Giftset which features both campy classics in collectible packaging, including the new-to-DVD Shock Treatment 25th Anniversary Edition plus the two-disc The Rocky Horror Picture Show 25th Anniversary Edition for a suggested retail price of $29.98 U.S. / $45.98 Canada. In this semi-sequel to the cult-classic The Rocky Horror Picture Show, we find Brad and Janet's not-so-new marriage on the rocks. They decide to appear in a game show, but find themselves stuck in a weird television-world, surrounded by strange people. Janet begins to enjoy her new life within the television world and begins to forget about Brad. Brad, on the other hand, has been imprisoned on a mental hospital program and is not enjoying himself. Will he win Janet back before she is seduced away from him forever? Fasten your garter belt and come up to the lab and see what's on the slab! It's The Rocky Horror Picture Show Special Edition, a screamingly funny, sinfully twisted salute to sci-fi, horror, B-movies and rock music, all rolled into one deliciously decadent morsel. And now there's even more to make you shiver with antici... pation: two additional musical numbers, "Once In A While" and "Superheroes", never seen theatrically or available on video! The madcap, musical mayhem begins when rain-soaked Brad and Janet take refuge in the castle of Dr. Frank-N-Furter, a transvestite mad scientist from outer space who is about to unveil his greatest creation - and have a bit of fun with his reluctant guests! Join Tim Curry, Barry Bostwick, Susan Sarandon and rock star Meat Loaf in the most popular cult classic of all time. A recognized global industry leader, Twentieth Century Fox Home Entertainment LLC is the worldwide marketing, sales and distribution company for all Fox film and television programming on VHS and DVD as well as video acquisitions and original productions. Each year the Company introduces hundreds of new and newly enhanced products, which it services to retail outlets � from mass merchants and warehouse clubs to specialty stores and e-commerce � throughout the world. Twentieth Century Fox Home Entertainment LLC is a subsidiary of Twentieth Century Fox Film Corporation, a News Corporation company.